I have no idea as to what he is drinking but here's a picture of Keanu Reeves drinking somthing that looks like Franchise Swill. Or maybe it's high end in a paper cup. I suppose with these millionaires time is money so they've got to be on the go. 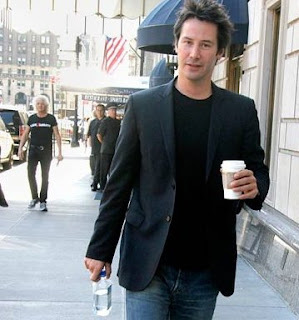 Woa what's Keanu Dude. Are you drinking Stabucks. That'll give ya speed man.